Subway is known for its 6-inch and foot-long submarine sandwiches, but the fast-food restaurant also offers its sandwiches on flatbread instead of regular sub rolls. Individual restaurants bake their own submarine rolls on-site, but they receive deliveries of flatbread after it is already baked. The nutrition information of a flatbread sandwich depends on the fillings and toppings you choose. The 6-inch flatbread has 220 calories, 4.5 grams of fat, 38 grams of carbohydrates and 7 grams of protein, or 14 percent of the daily value. These values are similar to those of the other 6-inch sandwich breads at Subway. The flatbread has 340 milligrams of sodium compared to 270 milligrams in the Italian and nine-grain wheat breads and 1,240 milligrams of sodium in the roasted garlic bread. A 6-inch flatbread provides 30 percent of the daily value for calcium, which is an essential nutrient for building strong bones. The bread has 2 grams of dietary fiber, which is half the amount in the nine-grain wheat bread and honey oat bread options. The lowest-calorie Subway flatbread sandwich listed on the menu is the B.L.T. on flatbread, which has 320 calories when you order it with lettuce, tomatoes and bacon. Higher-calorie options include the chicken and bacon ranch on flatbread, with 580 calories, and the big Philly cheesesteak on flatbread, with 510 calories. The tuna sandwich has the lowest sodium content, with 660 milligrams, while the steak and cheese, Subway melt, buffalo chicken and cold cut combo all have over 1,000 milligrams of sodium, or nearly half of the recommended daily maximum of 2,300 milligrams of sodium for healthy adults. At Subway, you can choose which toppings to add to your sandwich. Mayonnaise, ranch dressing and chipotle southwest sauce each add 100 calories, with most of them from fat. Lower-fat condiments include mustard, fat-free red wine vinaigrette, honey mustard sauce, sweet onion sauce and light mayonnaise. Bacon, avocado and pepperoni add calories and fat, while pickles and black olives increase the sodium content. A serving of cheese for a 6-inch flatbread sandwich adds 50 to 60 calories and 8 percent to 10 percent of the daily value for calcium. To add more nutrients to your sandwich while limiting the calories, add more vegetables, such as tomatoes, lettuce, onions and green peppers, and limit high-calorie condiments. 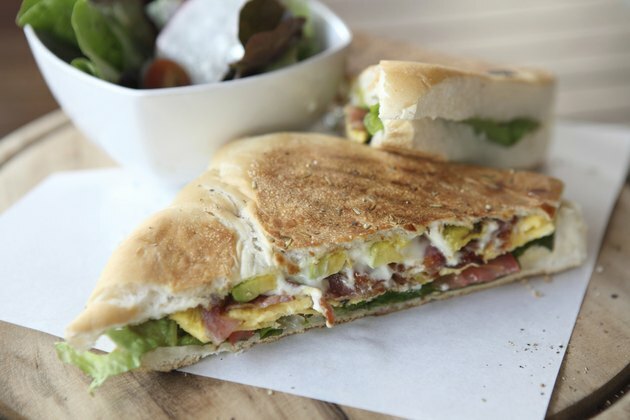 Subway also offers 3-inch breakfast sandwiches on flatbread. The egg white and cheese sandwich is the lowest-calorie flatbread breakfast sandwich, with 170 calories. The highest-calorie option is the mega-melt with regular eggs instead of egg whites, which has 280 calories. These values do not include optional additions, such as bacon, with 50 calories; avocado, with 60 calories; or vegetables, which add vitamins and fiber but minimal calories.